In the war of words over the issue of Holy Communion, few have been more vocal — on both sides of the fence — than Cdl. Raymond Burke and Cdl. Donald Wuerl, who continue to slug it out in the public square. Cardinal Burke, known for consistently coming to the defense of Our Lord, stands in sharp contrast to Cdl. Wuerl, whose concern for the slighted communicant seems to eclipse any care for Our Lord in the Blessed Sacrament. In 2004, debate flared up among the U.S. bishops over the question, after Senator John Kerry — a Catholic and longtime advocate of abortion — announced his bid for presidency. The question was if politicians like Kerry should be denied Holy Communion, as mandated by canon 915 of the Catholic Code of Canon Law. [It] is a sacrilege to receive the sacrament when one is not in the state of grace. One who publicly condones and promotes objectively grave sin also lacks the proper disposition for the worthy reception of holy Communion. ... [F]or the Catholic politician to receive Communion when he or she has publicly violated the moral law in a grave matter like procured abortion risks leading others into thinking that they can accept procured abortion with a right conscience. In such a case, if the Catholic politician does not recognize the lack of the proper disposition to receive Communion, then the church herself must refuse the sacrament, in order to safeguard the worthy reception of the sacrament and to prevent a serious scandal among the faithful. He went on to lament the "general failure in the Church to teach effectively the truth about the holy Eucharist and what is required to approach the sacrament worthily." The matter was put to a vote at the annual U.S. Bishops' meeting in June 2004, just a few months before the election. The result? The majority — contrary to the clear language of canon 915 — voted to leave the question to the discretion of each bishop in his own diocese. A small minority, including Cdl. Burke and a handful of others, had voted for a universal application of canon 915: Communion must be denied to any and all public figures who support grave sin. Burke's position was supported by then Cardinal Joseph Ratzinger, prefect of the Congregation for the Doctrine of the Faith, who had written a memo to Washington, D.C. cardinal Theodore McCarrick, head of the USCCB Task Force committee, making clear canon 915's language referred to mandatory, not optional, denial of Holy Communion to public impenitents — but that fact was only found out after the vote. The letter, meant to guide the American bishops in their decision, had in fact been suppressed by McCarrick as well as then-USCCB president Wilton Gregory, who kept its contents to themselves. In fact, McCarrick mischaracterized the memo in his interim report to the bishops, summarizing Cdl. Ratzinger's words to mean the opposite of what they actually said. It was only after the Italian weekly L'Espresso published the confidential Vatican memo that the bishops — to their surprise — learned of its actual contents. McCarrick was caught in his deceit. American media criticized the cardinal for his deception, and Vaticanista Sandro Magister said McCarrick's report represented "a clear divergence" from the Ratzinger memo. Cardinal Burke also expressed dismay. [The memo] certainly was not made known to me and I do not believe it was given to the other bishops. Cardinal McCarrick referred to the memorandum. We were told that, according to Cardinal Ratzinger, the application of the Canon 915 was up to the prudent judgment of each bishop. The text of the memorandum would have been very helpful at the meeting in Denver. Knowing now about the memo, I am disappointed it was not given to us at the meeting of the Bishops' Conference. Several years later in 2007, a year before he'd be appointed prefect of the Apostolic Signatura, Cdl. Burke published a paper criticizing the June 2004 vote and what he deemed widespread confusion among bishops on the question of canon 915. Among prelates singled out for criticism was then-Bishop Donald Wuerl, whom Burke charged with failing to understand Church law. Stung by the critique, Wuerl continued in his steadfast refusal to apply canon 915, insisting two years later — to the scandal of the faithful — that he wouldn't withhold Holy Communion from Speaker of the House Nancy Pelosi, a Catholic and notorious public advocate of abortion. Justifying his stance, Wuerl alluded to the June 2004 vote of the US bishops, saying, "I stand with the great majority of American bishops and bishops around the world in saying this canon was never intended to be used this way." This decision, properly speaking, is not a sanction or a penalty. Nor is the minister of Holy Communion passing judgment on the person's subjective guilt, but rather is reacting to the person's public unworthiness to receive Holy Communion due to an objective situation of sin. Cardinal Burke noted that it was not the minister wielding Communion as a weapon but rather the pro-abortion politicians "using the Eucharist as a political tool" in their obstinate refusal to respect the Sacrament. 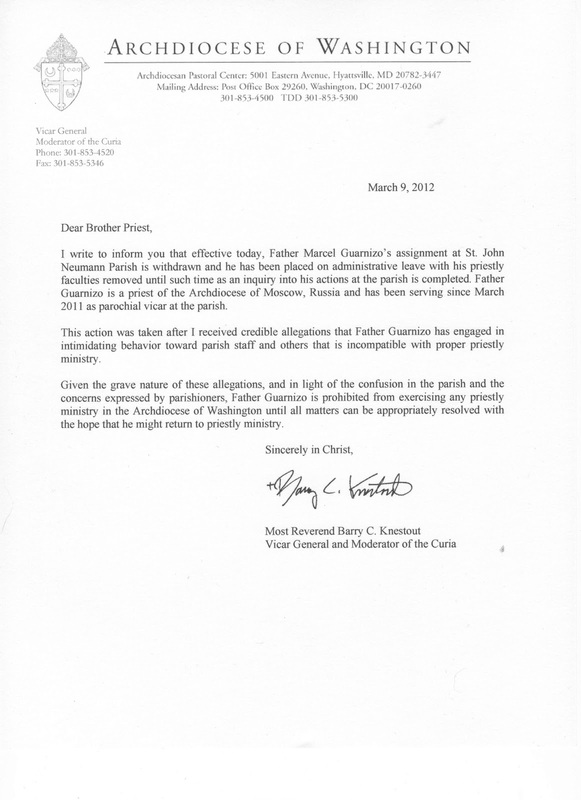 In March 2012, Wuerl took his position even further: He punished a priest for his attempt to defend the Eucharist. Father Marcel Guarnizo, longtime visiting priest in D.C., learned just before a funeral Mass that a practicing lesbian Buddhist was in attendance. When she came up to receive, he quietly withheld Communion from her, after which she promptly switched lines and received from the extraordinary minister instead. Cardinal Wuerl's condemnation was swift. Within days Fr. Guarnizo was stripped of his priestly faculties and placed on administrative leave, accused by the archdiocese of allegedly "intimidating behavior" — while the archdiocese went out of its way to issue an apology to the lesbian. Journalist George Neumayr excoriated Wuerl for his cowardice. If Cardinal Wuerl doesn't have the guts to deny Communion to an agitprop lesbian Buddhist, he should just close up shop and hand the keys to his chancery over to Obama. ... The Church's position on whether a bishop should stop sacrilege and scandal is not determined by his "comfort" level, Cardinal Wuerl. It is determined by the clear requirements of canon law. Cardinal Burke has spoken; the case is closed. Either the bishops take control over their own sacraments or the Church's enemies will. Within a week, the editors of the The American Spectator, which ran the column, received a complaint from Wuerl's communications director. Neumayr later wrote, "This is pretty much what I expected. Wuerl is notoriously thin-skinned about sharp criticism from orthodox Catholics." For his part, Fr. Guarnizo defended himself against the archdiocese's charges, writing in a letter, "I am going to defend my conduct in these instances, because what happened I believe contains a warning to the Church." "I did the only thing a faithful Catholic priest could do in such an awkward situation, quietly, with no intention to hurt or embarrass ... . It seems to me, the lack of clarity on this most basic issue puts at risk other priests who wish to serve the Catholic Church in Washington, D.C."
He included this revealing tidbit: "I would only add for the record that the letter removing me from pastoral work in the Archdiocese of Washington was already signed and sealed and on the table" before he was given any opportunity to defend himself. Four months later, the archdiocese clarified that Fr. Guarnizo was no longer engaged in active ministry for them. Barbara Johnson, the lesbian at the center of the controversy, cheered the announcement, saying news of his downfall brought her "great comfort." She went on to praise Cdl. Wuerl for acting "swiftly initially not only to point out that his behavior was wrong and not in accordance with their policy but then to suspend him." Cardinal Wuerl was required to tender his resignation Thursday on reaching age 75. Whether the Pope accepts it and allows Wuerl to retire remains to be seen, but if he does, the faithful don't necessarily have reason to rejoice. Released from obligations over an archdiocese, Wuerl's time would be freed up to more aggressively push his left-leaning reforms in the media, continuing his attempts to shape the Church in his own image. In the next installment: Cardinal Wuerl's failure to defend Christ in the debate over Communion to the divorced and civilly remarried. To learn more about the doctrine of the Eucharist, watch our One True Faith episode Eucharist: The Real Presence.